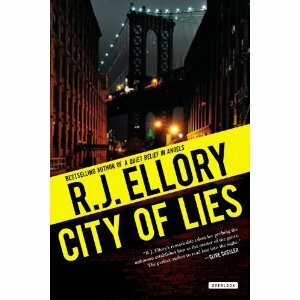 ‘City of Lies’ (2006) was the fourth novel I published here in the UK, and was written with a very specific and definite intent to create an almost cinematic experience. I wanted to write a book that – once read – would perhaps leave the reader with the same feeling that would have remained subsequent to seeing a film. Following the publication of ‘Candlemoth’ in 2003 and ‘Ghostheart’ in 2004 I completed a novel entitled ‘Burying Goliath’. I submitted this manuscript to my editor in March of 2004 and then met with him to discuss some changes we considered necessary. Following our discussion he asked me what I was working on for book number four. I happened to have about 40,000 words with me on a disc – a ‘vast Mafia epic spanning seventy years and ten different cities’. My editor asked if he could read it, and he took a copy. I returned home to Birmingham, and two days later he called me to say that he wanted to publish this new incomplete novel after ‘Ghostheart’. He wanted to hold off on releasing ‘Burying Goliath’ as he felt that the fourth would serve better as the third, if only from the viewpoint that it was so very different from ‘Ghostheart’. He asked if I could complete the book within eight weeks. The resultant script was ‘A Quiet Vendetta’, released in August 2005. ‘Burying Goliath’ was quietly and ceremoniously buried (excuse the pun! ), but there was something about the central character – a once-published novelist and newspaper journalist called John Harper – that I missed. And so when it came to working on another novel I resurrected John, and following the laborious task of transferring about 10,000 words from first person to third person, I used that material for the beginning of a script with the working title ’66 Carmine’. 66 Carmine was a fictional New York address (as Carmine Street is not a residential location), and here we found the house where John had been raised by his Aunt Evelyn, John having lost his mother and father very early in life. At nineteen he’d left New York and headed for Florida, written one novel, and then become a newspaper journalist for the Miami Herald. Confronted with the truth of his father’s existence, John meets a number of his father’s long-term friends, and quickly finds himself seduced by a lifestyle that he seems to have inherited – an underworld life of power, treachery and menace. Desperately trying to uncover the facts of his own past, John is faced with one lie after another, and with each new discovery he is drawn further into a conspiracy that will result in one of the most audacious criminal enterprises in New York’s history. Twisted like a Gordian knot, the story weaves back and forth between truth and fiction towards its conclusion. The finished work, entitled ‘City of Lies’, is a novel about identity, about the truth of one man’s life, and how the discovery of facts about the past have the power to influence the present. After ‘Candlemoth’, ‘Ghostheart’ and ‘A Quiet Vendetta’, all of them structured in a double-narrative style (where two stories run simultaneously and ultimately become the same thing), I wanted to write something that was a purely ‘linear’ thriller. Spanning a series of days (in this case the twelve days leading up to Christmas Eve), I wanted ‘City of Lies’ to read very rapidly. As I said, I wanted it to be almost cinematic in its nature. I began with the idea that a book could be written in such a way as to present consecutive images that overlapped one another, and as each new sequence was detailed something further was gleaned about the overall plot. In my mind’s eye I imagined being able to take a pencil and put a line through all the descriptive passages and leave nothing but locations and dialogue, in essence a film script. The dialogue was the driving force behind the atmosphere of the book, and here I invested the greatest amount of care. The people Harper becomes involved with upon his return to New York are effectively ‘old school’ gangsters, some of them in their fifties and sixties, and though they are dated I still wanted their conversations and expressions to reflect the awareness that the New York of the 21st Century was not the same as New York in the seventies and eighties. These people have become a dying breed, out-run and outflanked by the Hispanic gangs, the Eastern Europeans, the crack dealers and gun sellers. Harper himself is caught in the midst of an incipient war over conflicting territories, and though he is in no sense a gangster he is nevertheless both seduced and manoeuvred into a position where he has an active part to play in the outcome of the war. Where previous novels had perhaps concentrated on the creation of an evocative atmosphere and the use of prose as a character in itself to give substance and body to the material, ‘City of Lies’ stepped away from that. In essence it is a much more direct and succinct work, concentrating far more on the situations the characters find themselves in, and less on the world around them. My goal as a novelist has been very simple. Someone once told me that there were two types of novel: those that you just could not put down, where the narrative drive carried you through to the end ‘because you just had to find out what happened’. Secondly, there were those novels that were read and appreciated simply because of the style of writing and the nature of the prose. I appreciate both types of books very much, and thus I have always striven towards creating works that are a combination of the two. With ‘City of Lies’ I hoped to achieve this, and hoped also that there would be a sufficiently wide readership garnered to allow me the pleasure and ability to continue to write, for this is my passion and my purpose, above all else. In hindsight, taking into consideration the fact that it has now been the better part of a decade since I wrote that book, I have been sent more recommended film casts for this book than any other. Invariably, I have found Dennis Hopper, Christopher Walken, Philip Baker Hall, Chris Cooper, Harry Dean Stanton and so many other extraordinary character actors suggested, which – for me – is perhaps the highest form of compliment. Somehow the people in my head ended up as people on a page. A friend of mine (who was my guitar tutor for a while) once said that music was almost like an emotion from one individual translated into sound, and then that sound was transmitted to another person who experienced the same or a different emotion at the receiving end. I think stories are the same. I can imagine that the author’s intended emotional effect would very rarely be the same as any reader’s received emotion, but that’s not the point. As with music, the intention is simply to evoke an emotional response, and that is all I have ever wished to do with my books. Excellent. Another to look forward to. I'm currently savoring Saints of New York, which I think may become my favorite of your books. Thank you Roger, for sharing your thoughts on writing, and for the wonderful journeys your books take me on.